not only in our bd we must remember all the good thing that happen to us as childrens; and we shouldn't remember this memories only for reminiscence... we must try to remember this age for recover the innocence on our life. when we was children the simple things could make us really happy... why this cann't be possible now? painted on photoshop cs3 at 3200x2400 pixels. four days of work. Really nice! I love the Nekobus! It's like a dream, i didn't know this anime, but seems very interesting! Well the mice are nice too and the frog in the middle of the road is so funny, jeje, well i hope you can understad the idea because you know, my english is really bad, however, good job! I'm in love with it *-* So great! lol that would be because they are both movies by Studio Ghibli ^-^ Im sure they have similar concepts. I think both of them are by Hayao Miyazaki. very nice annakee-san! Im guessing the totoro part is still part of the original scan (please correct me if im wrong though) and you added on. I can tell where you added on if I look very closely, but you can barely tell. I think whats giving it away is the blurriness of the parts you added on. If you look closely at the original scan, you can see that although it does have a painty style, its less smooth, and it has a rather messy, textured look. There seems to be watercolor stains blended in as well. The parts you added on seem to be a little oversmudged, which makes it look blurry in contrast to the original scan. But like I said, this is barely noticeable! ^-^ I love totoro, and I love this wallpaper too. This will be my new background then..hehe. I love Mei although she did annoy me during some scenes of the movie. 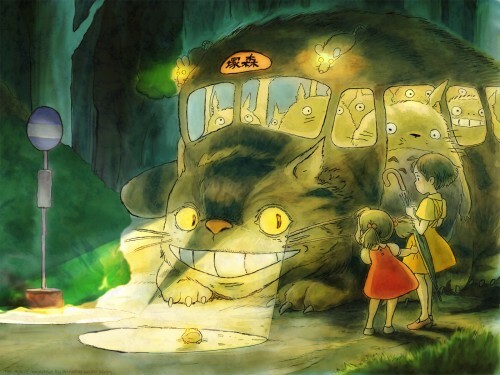 I think your title fits the anime very well since Totoro is basically about childhood and innocence (thats why adults cant see the neko-bus or totoro!) hehe. oh wow this is so great! I love the scan you chose and love the background and well you did so awesome with all the painting. Great work! Whoa...a neko bus! That's really a unique feature, especially with those nice colored textures! Awww that's so cute! It looks great ^^ I love totoro, and the cat bus =D There was a ghibli exhibit in my town once, and I volunteered at it. There was a cat bus that you could go in! It was awesome =3 But yeah, I love this bg xD Well done! 4 days? OMG, you got some patience there. I absolutely LOVE ghibli .. I remember seeing Totoro when I was little. You did a fantastic job on this ... I like how it turned out. Very lovely. You get a shiny star. xDD ahaha. Oh yes. I can enjoy it. Such a aw inspiring theme. My Neighbor Totoro...But, I haven't ever seen it. Still, it is a great painting. It speaks..."The bus is FULL! How are we going to fit on it?" It's very funny.